Hannah Storm: We are joined by Arnold Palmer’s long-time rival, and a man who ended up being one of his closest friends. The two will always be associated with each other in golf history, as we’re joined now by Jack Nicklaus. And, Jack, I just wanted to personally send my condolences to you and your family for the loss of your dear friend. Jack Nicklaus: Well, Hannah, thank you very much. He was a good guy and a good friend. Hannah Storm: Tell me how your relationship evolved—what it as at the start in terms of a golf rivalry before it became a friendship? 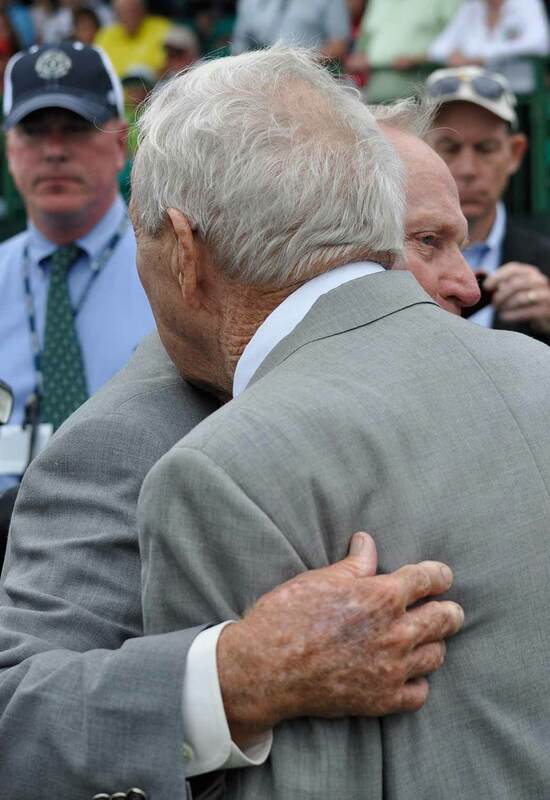 Jack Nicklaus: Well, it started… The first time I met Arnold was in 1958. We were playing Dow Finsterwald in Athens, Ohio. Dow had won the PGA Championship the year before. I was invited to play and we started off on the first tee. We had a driving contest, and I won the driving contest. Then, we finished the round and Arnold shot 63 and I think I shot 67. I never thought much about it at that time, but every time after that we talked about the first time we met and I’d say, “I out-drove you there,” and he’d say, “But I shot 63 and you shot 67. I gotcha!” That was when I was 18 years old. Then, the first time we really played was at Phoenix in 1962. That’s the first time we actually played in a tournament and that was my first year on TOUR. Arnold treated me like a young kid coming up. He sort of took me under his wing. We walked off the 17th green on the last round and he put his arm around my shoulder. He was going to win the tournament by 12 shots. And he said, “Okay, take your time. Just relax. You can birdie this last hole and finish second,” which I did, and I thought that was pretty nice of a guy to do that. Well, I don’t know whether he realized that I was going to compete against him, because we got to the U.S. Open in 1962 in the same year, and then all of a sudden we ended up in a playoff and I won. And, all of a sudden that was the start of our “rivalry.” It was the start of what you might say was my fight with Arnold’s friends, or Arnold’s fans. But the one thing about that was I never had to fight him. I always had to fight his fans but I never had to fight him. So, Arnold was always a friend. We always loved going out and trying to beat each other. Too many times we’d go out in an event and we would forget that we were leading a golf tournament. By the time we finished a round, one of us would have a 73 and the other one would shoot 75. We’d say, “Aha! I got you today.” But everybody else in the field beat us. That was not healthy, but we did that, unfortunately. It was a rivalry I think we both enjoyed. It was competitive. It was fantastic. We’d finish a round of golf, get done with it, shake hands, and say, “Okay, where are you going to dinner tonight?” I’d say, “Let’s play some bridge. You and Winnie play Barbara and I.” We did that constantly. We played it on the airplanes going across the Atlantic to the British Open. We traveled together. We ate dinner together. We played golf together. We were partners in The Ryder Cup and The World Cup together. We spent a lot of time together, but we loved beating each other. That was what you might say “wound our watches.” It was something that, until our dying days, we just loved to compete against each other. Hannah Storm: So what was your favorite win against Arnie? Jack Nicklaus: Well, I think any time. And I think he would say the same! Any time we beat each other, that was my favorite! 1962 [the U.S. Open] obviously got my career started. That was the biggest win I probably had in my career. Of course, beating Arnold in his own backyard was something that kicked off my career. Hannah Storm: What do you think you guys learned from each other? Jack Nicklaus: I think we both believed in the traditions of the game. We both believed that the game of golf was bigger than both of us. We both believed that it should be played in the right way with integrity and sportsmanship, and to try to do things the right way. I think we learned that from each other. I think his dad taught him well, and I think my father taught me well. I think we both saw that in each other. So, I think that’s why we became such good friends. We both were interested in the game of golf and the growth of the game, and making sure the game continued beyond us in the right way. Hannah Storm: And when your playing careers ended, how did your relationship continue to evolve? Jack Nicklaus: We never really ended our playing careers. We still played each other up until a couple years ago. I think that’s the beauty of the game of golf. Whether we were out there shooting 65 or 80, it didn’t make any difference. We still enjoyed being a part of it and needling each other. Of course Gary [Player] was a part of that deal, too. If one of us shot a bad round, if one of us shot a 75, he could expect the other two to be sitting at his locker when he got to the locker room. “Oh, okay, AP, you shot 75 today. Tell us about all your birdies. Tell us about this wonderful round.” You just couldn’t wait to needle the other guy. They’d be there if I shot 75. That’s just the way it was. We kidded each other and we laughed at each other, but we supported each other. That’s exactly what we tried to do. Hannah Storm: Can you share with us any moments over the last couple of years, Arnie had not been in good health but he was certainly as determined and as sharp as ever. Jack Nicklaus: You know, it was amazing. We have been going to the Masters for years and doing all kinds of things up there. Two years ago, when he hit the ball off the first tee, he hadn’t hit a golf ball in probably six or eight months. He’d fallen down, and dislocated his shoulder, and they couldn’t get it back in. He was going to hit a golf ball off of the first tee. That was his competition. He was going to do that. And he did. He did it pretty well. I don’t remember where the ball went, but he did it pretty well. This year, he couldn’t do that. It darn near killed him to go out to the first tee, but he couldn’t hit the golf ball. You know, I’m doing a golf course out at The Greenbrier right now with Arnold, Gary [Player] and Lee Trevino. Arnold, you know, not particularly in good health, was there—he showed up to be part of what we’re doing and to be together. He made a commitment to do that, and that’s what he wanted to do. Things haven’t changed. Maybe the degree of how we do them has changed as we’ve gotten older, but we all have continued to make commitments and continued to fulfill them. Arnold always fulfilled his commitments. Hannah Storm: His legacy is so far-reaching, and it’s also different depending on who you talk to. I’m wondering from your perspective, what do you think his lasting imprint is? Jack Nicklaus: Well, his lasting imprint to me is that he was the one who started the game of golf from a public standpoint; from a visual standpoint; from a fan standpoint. He created, with his charisma, a fan-base when television stared. He was the guy who sort of led the way. To me, he did it pretty much by himself to start out with. Sure, the rest of us came along, but we was the leader of that. We all look back and we all thank him for that. He got the nickname of being “the king.” He’ll still be the king. He’s always been the king and he always will be. I think that’s a nice thing—that you remember a guy for what he did and how he handled himself, and how he took care of people coming along behind him. He was a guy that cared about the other guys and cared about people. He tried to live his life that way, and he did. Hannah Storm: The king to many and a dear, dear friend to you. Jack Nicklaus, we so much appreciate you joining us this morning on SportsCenter. Again, we’re sorry that you lost your friend. Thank you so much for giving us such great perspective on his life. Jack Nicklaus: Well, thanks, Hannah. Golf lost a great friend, and the game of life and sport lost a great friend. But he’ll be remembered always for what he gave and what he contributed.